As so often in my life, it was a patient that provided the enlightenment. I had been working as a locum in Worcester just after the Millennium and the NHS was embarking on another round of what management termed euphemistically as “service rationalisation”, which those at the sharp end of clinical delivery understood to be another term for discharging patients from long-term palliative care. Historically, the NHS used to provide “chiropody” to people who fulfilled certain criteria – pensioners, pregnant women, school-children and those with an underlying medical condition, such as diabetes, poor circulation, arthritis or those with an incapacity like blindness or what we now call learning difficulties; the mentally handicapped. Over the last sixty years, as the podiatry profession developed its scope of practice, other patients were routinely included in NHS care. Adults with acute conditions like ingrown toenails and gait disorders could be referred by their doctors and by the time I qualified in 1983, some podiatrists had undertaken training in surgical practise – initially in the USA – for routine and complex foot and ankle bone surgery, normally the domain of the orthopaedic surgeon. But these advances in clinical provision – as welcome as they are for any discipline, also stimulate demand – and that brings us back to the perennial problem of cost and funding of NHS services. Since the introduction of general management principles in the NHS following Roy Griffiths’ Report in the 1980’s, care has been prioritised in line with funding. As new treatments have emerged, the demand for services and its impact on NHS budgets have increased exponentially, and as always when bean-counters and bureaucrats are in charge, something had to give. In NHS podiatry clinics during the 1990’s onwards, what ‘gave’ was the care provided to millions of people up and down the breadth of the UK, who suddenly found themselves on the wrong side of an administrative line that specified new criteria for access to services, which precluded a subtle shift away from clinical ‘need’ – to clinical ‘risk’. Now, I don’t really have an issue with that – nor do most clinicians who have worked in the NHS. If someone is in urgent need of care, then of course they should be prioritised; that is simple common-sense, but unless funding increases at the same rate as clinical demand, there will always be a shortfall and some people will lose out. Such are the times we live in. A few months before I came to Worcester, I was working in a fairly remote clinic in the middle of the North York Moors and had turned up for my first clinic near Helmsley and was met by the Service Manager, who explained they had contracted me for four weeks to help “re-educate” the patients who made up the bulk of the service caseload in rural and remote clinics. Patients (or service users, as they were now labelled) were to be encouraged to look after themselves and their own foot problems. Nail files and callous rasps were provided and I was supposed to encourage the recipient that it would be much better if they looked after their own feet or that of their partner. It was called “empowerment”. I only lasted a week in that post and found the whole approach distasteful and quite dangerous. No provision had been made for those people to have their treatment provided elsewhere – and it was quickly apparent the new criteria was iniquitous, if not, dangerous. The “at-risk” criteria included those people with diabetes, thus in some NHS trusts, a twenty-something insulin dependent diabetic could have regular chiropody care – even though their “need” was minimal – but a ninety-six year-old with painful age-related conditions, but no qualifying medical criteria, could not. In Worcester, the Trust had provided a letter that could be handed to patients to help them understand the new conditions for access. In typical NHS management-speak, it presented a warm, fuzzy illusion of giving everything whilst taking more besides away. My patient that day read the letter with a smile… “How lovely. Just as Mr Blair predicted!” he said, and I thought he was talking about the current Prime Minister before he explained what and who he really meant. “It’s ‘doublespeak’”, he announced. “Haven’t you read 1984? Rationalisation, prioritisation, empowerment! Monkeys could do better any day…” and he would know, being an authority on primates as well as many other subjects…. I was reminded of Sarel last Thursday at the conclusion of the proceedings in the Crown Court Appeal with the HCPC in Preston. 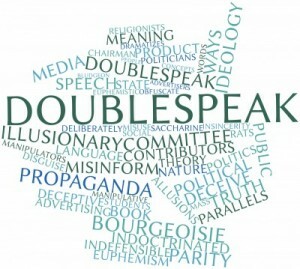 Sarel had offered countless examples of doublespeak that I should have been familiar with. Simple deception and lies to complex propaganda designed to induce mass deception. Within a few simple sentences he explained what was really behind the Iraq conflict and the rise of Islamic fundamentalism; a view that still holds primacy today. But I never expected the most devious and deceitful examples of this duplicitous practice from a government health regulator and its legal representatives – nor indeed did any other of my colleagues in podiatry or any other of the health professions. Having given evidence last Thursday and as there are no reporting restrictions, I can now offer a more detailed commentary on this curious and worrying business – and I will do so over the coming weeks. Those that have the capacity to remember these things will recall I pled guilty to an offence just over two years ago for using a professional title without being registered with an appropriate authority – a medical regulator. It wasn’t an oversight – I had deliberately withheld my registration fee (£74) – and for good reason – but the offence I thought I was pleading guilty to, actually didn’t exist and it turns out, I wasn’t doing anything illegal in the first place. I feel rather uncomfortable writing that as it amply illustrates what a fool I have been, but I do take some comfort in the knowledge that my ignorance was shared with just about everyone else in the health professions and most of the public too! We have been blatantly lied to – or deceived – if you prefer, by a medical regulator and government who have a different agenda altogether than the one stamped on the regulatory and public-safety tin. In law, this is called fraudulent misrepresentation. Plus ça change! And nobody was any the wiser. I was in the witness box for just over five hours and only managed to make Mr Holland lose the plot on two or three occasions, but it was good fun all the same. I’m going to look forward to his explanation of the difference between “unlawful” and “illegal” one of these days, perhaps when I’m adjusting the rope tension when he starts that airy and exposed traverse on Crowberry Ridge. If I can persuade him it might be in his best interests – and providing he’s fully tuned into the dialect, it should be one of life’s more captivating moments. But Thursday was certainly an illuminating and enlightening experience. I’m also looking forward to the day when he can unearth the piece of paper from his client telling me I could write unregistered and still win the lottery. Who would’ve known? Certainly not me…but who did provides the answer to the question; “who is responsible for this prosecution?” Can you guess yet? Unfortunately, we haven’t finished. I should never have tempted fate by suggesting there might be a prologue, but the Judge had a prior appointment in London and had to scoot away sharpish for the train and we finished at 3.30pm and with another few witnesses to call, she adjourned matters until 26 February next year. For the final time. Hopefully. At this rate, Mr Holland will be able to buy Lochgelly or Cowdenbeath on the fees he’s earned in this case alone and he doesn’t even know what it’s all about yet. Isn’t life funny indeed? And the 26th February is, coincidentally, the same date as the last successful appeal at the Old Bailey two years ago. Would you believe it? As I have written elsewhere, I am fast running out of currency – if not monetary then in gratitude – and it was fantastic to see so many colleagues and friends in the public gallery. It is during these occasions that you discover who really matter in your life – and that is never a bad thing. Thank you again for all that made the effort – it was hugely appreciated. UPDATE: I was informed at 6pm 14/12/15 that Mr Holland is unavailable on the 26th and a new date is yet to be set. Merry Christmas. Hen’s teeth, Ken. 24 carat ones…. I find it hard to believe that people trying to adjudicate can just up and off part way through a difficult hearing. It is not a just and fair way of conducting any hearing whatever the subject. You would also hope that major truths would shine through the dross and idiocy of procedure. I personally, as a professional person, have little faith in relying on the law to administer justice. I know of solicitors afraid to go to law on matters they fervently believe in. What an unholy mess. What happened to common sense. Until it becomes currency heaven help us. Good luck. Quote me if you like but it won’t make a blind bit of difference. I hate to see blatant injustice. I’m booking you a seat for the conclusion. You can bring the tomatoes! I wonder how much of Registrants’ money has been wasted on this silly business that will achieve nothing? You can always ask under the FOI process, but I would imagine somewhere in the region of £250K wouldn’t be far away by the time you factor in counsel and solicitor costs. I don’t think either of these parties would consider it money ‘wasted’ though, quite the opposite. Money is really what it’s all about – and protecting the source, whatever the cost.